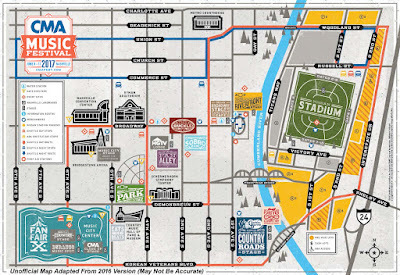 Updated Festival Map - Unofficial 2017 CMA Music Festival Map! Since the CMA hasn't seen fit to release this year's festival map, we took the liberty of updating last year's. This is an unofficial map that may not be 100% accurate, but it should give you the basic lay of the land until the CMA releases the official 2017 CMA Music Festival Map. Click the picture for an enlarged version! Enjoy!